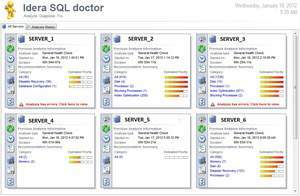 HOUSTON, TX -- (Marketwire) -- 03/20/12 -- Idera, a leading provider of Microsoft SQL Server management and administration solutions, today announced SQL doctor 3.0. Idera's revolutionary product that instantly diagnoses and quickly cures SQL Server performance problems now provides greater visibility of performance metrics for even faster resolution of SQL Server performance issues such as badly performing queries, mis-configured servers, security holes, and much more. "Idera's SQL doctor 3.0 rocks!" said John Moore, Database Administrator at Electrolux, a global leader in home appliances and appliances for professional use. "I love that the new interface gives me more metrics to drill down on my performance problems. In particular, the wait stats and the query plans are outstanding and provide me with on-point recommendations. Overall, it saves me time previously spent on problem research and resolution." New Server Dashboard - New dashboard provides an overview of the current health of the SQL Server instance as well as specific recommendations to eliminate performance bottlenecks, address security issues, as well as optimize server configuration. Statistics Analysis - View real-time statistics of query plans, wait stats and sessions with performance optimization recommendations to address any issues. Displays Key Server Information - Keeps tabs on processes, network interface cards, processors, cache, memory, physical and logical disk performance, disk partitions and other system parameters that can impact SQL Server performance. "What DBAs appreciate most with SQL doctor is the incredible time savings they experience when tracking down and resolving SQL Server issues," said Juan Rogers, Product Manager for SQL Server Products at Idera. "In the new version, DBAs can quickly drill down to see and eliminate performance bottlenecks." Idera and SQL doctor are registered trademarks of Idera, Inc. in the United States and trademarks in other jurisdictions. All other company and product names may be trademarks of their respective companies.